US Naval Institute Press, 9781612519067, 288pp. After being wounded and awarded the Bronze Star for valor as a Marine infantry platoon commander in Vietnam, Arnold Punaro thought he�d left the battlefield behind. Instead, he redeployed onto the battlefield of Washington politics. For almost fifty years, he�s toiled at the intersection of the political and defense establishments, working with such luminaries as Sam Nunn, John Glenn, John McCain, Colin Powell, Robert Gates, Ash Carter, and many others. Today Democrats, Republicans, and career public officials agree on one thing: few individuals possess the military experience, governmental expertise, and personal integrity of Arnold Punaro. Partnered with best-selling writer David Poyer, Punaro offers revelations about the most contentious issues of the past and sage advice for the future. 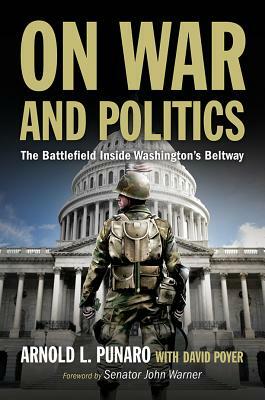 From his military service, to his role formulating and overseeing all major defense and intelligence legislation, Punaro reveals how decisions are really made inside the Beltway, providing insights into the actions of presidents since Jimmy Carter and Secretaries of Defense back to James Schlesinger. Unsparing in his criticisms of both parties, whose partisanship is leading our country over a precipice, Punaro presents radical proposals for much-needed reform to save the country for which so many have given their lives.